A Celebration of Life will be held for Murphy “Beau” R. Brown, 65, of Coos Bay, on Saturday, September 22, 2018 at 1:00 p.m. at the Coos Bay Chapel, 685 Anderson Avenue, with pastor Don Berney of New Beginnings Christian Fellowship presiding. Those attending are encouraged to stay for refreshments following the service. Private cremation rites were held at Ocean View Memory Gardens in Coos Bay, with a private inurnment to follow at Denmark Cemetery in Langlois. Beau was born on November 6, 1952 in Albany, Oregon to Carl G. Brown and June Rose ( Travis ) Brown. He passed away on September 10, 2018 at his home in Coos Bay, surrounded by his loved ones. Beau was raised in Coos Bay and attended Marshfield High School. He met the love of his life, Linda Roberts, in 1977 and they married in 1981. They spent 41 amazing years loving and enjoying each other’s company. They raised four daughters together, MJ, Shasta, Jessica and Carla. They spent many of their years together living in North Bend, raising their girls and attending all of their events and later all of their grandchildren’s events. Beau didn’t even like to miss a scrimmage if he didn’t have to. Beau also had a great love for the outdoors and enjoyed going on nature walks with his girls, hunting with his dad and later with his son-in-law Jaison. Anyone that knew Beau would know he was a dedicated Raiders fan with the apparel and memorabilia he had. 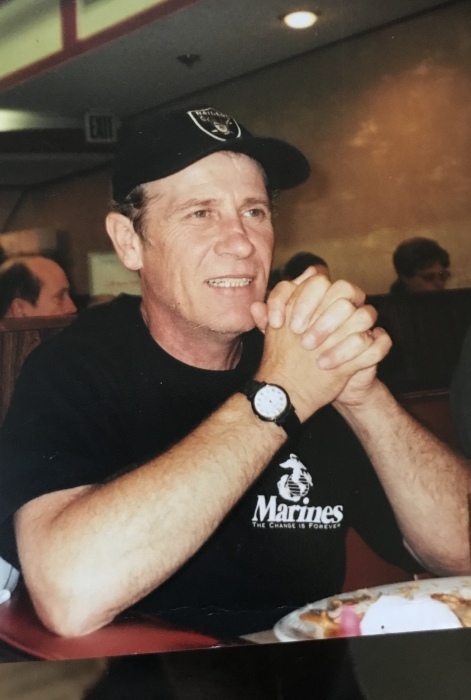 Beau was a welder/fitter on marine vessels for a number of years and later went on to work at Bay Area Hospital for 17 years as an OR Support Technician. But he would always tell you that his number one job was being a Dad, which he was the best that anyone could ask for. Everyone that knew Beau loved and adored him. He always had a way of making you smile and laugh. He will truly be missed by all of his family and all who had the honor of coming in contact with him. Beau is survived by his loving wife of 37 years, Linda May Brown of Coos Bay; Daughters, MJ Lester of Springfield, Shasta and husband Jaison Karow of North Bend, Jessica and husband Jack Cochran of Coquille and Carla and husband Daniel Dufner of Eugene; and 10+ grandchildren; Caelee, Zakary, Cruz, Savannah, Jack, Tripp, Traiven, Annika, Eva, Pate and one on the way. Beau was preceded in death by his parents, Carl and June Brown; and granddaughter, Carlee.